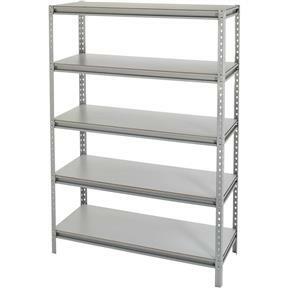 With the same design and construction methods as the T10002, this 5 Shelf Unit gives you a bit more storage space with an extra shelf and extra height. Great for organizing the garage or shop. Overall size is 48-1/2" wide x 19-1/2" deep x 70" tall. No tools are required for assembly. Each shelf will support 176 lbs. Approximate shipping weight: 120 lbs.